<Kanwa news April 12, 1999>: As the source of the Russian Severnoye Design Bureau indicated to the Kanwa reporter, things are going smoothly about Chinas purchase of the "Sovremenny"-class destroyer and on the basis of the current production situation, a timely delivery can be ensured. There were reports that the SSN22 manufacturer might not be able to deliver the missile on time due to the shortage of funds. However, the same source indicated that all the manufacturers concerned had timely received the deposits from China and that there was no such a problem as reported. CHINA PLANS TO DEVELOP THE NATIONAL-CLASS C3I SYSTEM. <Kanwa news April 14, 1999> In the aftermath of the crises in the Middle East and on the Balkan Peninsula, China attached great importance to the construction of its air-defense system. In this effort, China has expedited the development of various ground-to-air missiles and has enhanced the research of its C3I system (including command, control, communication, and intelligence). At present, the national-class C3I system is under development and planning. According to the source of the Chinese military industry, it has been several years since the development of the export-oriented C3I system started and some of its sub-systems have now been put to use in the Chinese army. The national-class C3I system of China is now under planning and its regional-class C3I system is expected to be completed within the next several years. According to the information that the Kanwa acquired, the national-class C3I system consists of two COCs and one MCOC as well as one VOC composed of the vessels on the water. Under the two COCs are several sets of coastal radar, coastal cannons, and sonar sub-systems. 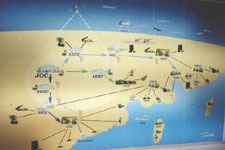 In addition, a data link is hooked to the NSOC, which, in turn, is connected via satellite with such systems as the JOC, ADOC, ARMY, and NNOC. The whole national-class C3I system also includes two EWOCs, each of which has the ECM, ELINT, and ESM sub-systems and is linked to the EW planes. Furthermore, a RIPS is installed on the C3I system and has under it several air-defense radar sub-systems. It is linked to the TADS system, which includes the ground-to-air missile troops, air-defense radar, and fighter planes etc.. It is worth attention that at least one MCOC will be set up in the so-called "liberated" Taiwan. The highest command level of the C3I system is the Joint Operations Center (JOC), which is directly connected with the ground army and the air-defense troops and assumes the overall commanding responsibility via satellite. It can be inferred that after the next century, the C3I system of China will rely more on the satellite for the monitoring and control purposes. Affected lately by the crisis in Yugoslavia, China will probably expedite the development of its national-class C3I system (Satoko Tomiyama). The Project 965 destroyer has anti-ship, anti-aircraft, anti-submarine and coastal bombardment capability. The ship, with maximum displacement of 8480 tons is similar in size to the USA Navy's Aegis-equipped missile cruisers, and is armed with an anti-submarine helicopter, 48 air defence missiles, 8 anti-ship missiles, torpedoes, mines, long range guns and a comprehensive electronic warfare system. The first-of-class Sovremenny was commissioned in 1985. A total of sixteen have been built for the Russian Navy , eleven of which are in service, six are no longer operational and one more (launched in 1994) is awaiting commission. Ttwo further ships have been ordered by China and are yet to be launched. All ships were built at the Northern Yard in Saint Petersburg, formerly called the Zhadanov Yard. The mission of the Project 956 ship is to engage hostile ships by means of missile attack, and to provide warships and transport ships with protection against ship and air attack.